Spectra: A low resolution spectrum obtained at Van Vleck Observatory by C. Littlefield (Wesleyan University) and P. Garnavich (Notre Dame) on 2015 October 11.99 UT across an airmass range of 3.6-4.5, which yielded noisy data, indicate the nova to be an Fe II-type classical nova (ATel #8156). Spectra by M. Fujii (Kurashiki, Okayama, Japan) obtained on 2015 October 12.421 UT at Fujii Kurosaki Observatory indicate a highly reddened nova (CBET 4150). His spectrogram is posted at http://otobs.org/FBO/etc/tcp_oph.htm. Observing recommendations: This nova is faint, but observations of all types (visual, CCD, DSLR, spectroscopy) as instrumentation permits are strongly encouraged as this nova evolves. Charts: Charts for Nova Oph 2015 No. 2 may be created using the AAVSO Variable Star Plotter (VSP). Be sure to include spaces in the name as shown. 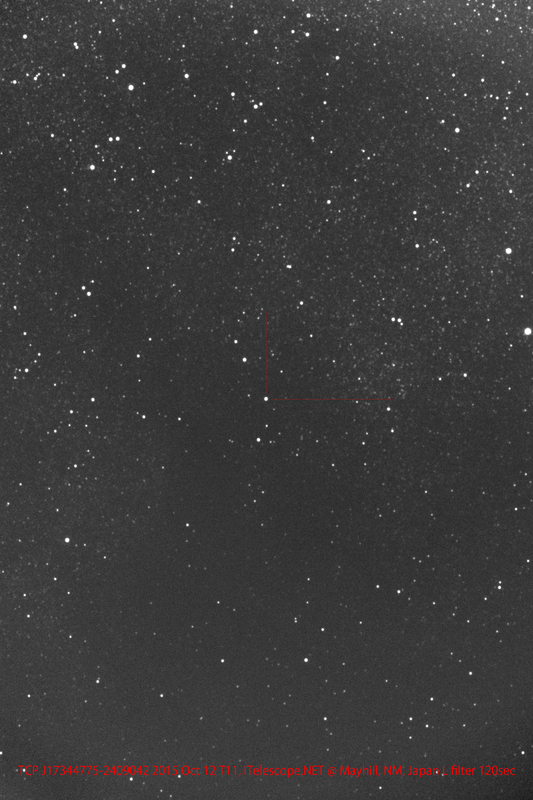 13.407, 12.9 V (T. Yusa, Osaki, Japan, remotely using the 0.43-m f/6.8 astrograph + CCD(FLI Proline 16803)at the iTelescopeNET, Siding Spring, Australia). Submit observations: Please submit observations to the AAVSO International Database using the name NOVA OPH 2015 NO. 2. Be sure to include spaces in name as shown. Once a GCVS name has been assigned, please use that name. a. Announced in IAU Central Bureau for Astronomical Telegrams Central Bureau Electronic Telegram 4150 (Daniel W. E. Green, ed.). Assigned the name TCP J17344775-2409042 when posted to the IAU CBAT Transient Object Confirmation Page (TOCP). The majority of information in this Alert Notice was provided via CBET 4150.
b. Nishiyama and Kabashima confirmed the object's presence on four 40-s unfiltered CCD frames taken around 2015 Oct 11.473 UT. They also report nothing is visible down to magnitude 13.4 at this location on a survey frame taken 2015 Oct. 07.405 UT, nor on DSS. c. Nishiyama and Kabashima report the nearest star in IGSL3 has position end figures 47.352s, 02.06", distance 5.9", and magnitude R2=18.55, I=16.44. P. Schmeer (Bischmisheim, Germany) reports the nearest USNO-B1.0 catalog source is USNO-B1.0 0658-0470476 (p.e. figures 47.346, 01.77), R1=18.88, R2=18.55, I=16.44. S. O'Connor reports the IR/2MASS source IRAS 17317-2407 has p.e. figures 48.27s, 02.6s. - S. Fujikawa (Kan'onji, Kagawa, Japan, communicated by M. Soma, National Astronomical Observatory of Japan, via CBET 4150), 2015 Oct 11.41474 UT, 47.36s, 06.6". - G. Masi (remotely as above), 2015 October 11.72132 UT, 47.74(02)s, 04.0(02)". - T. Yusa (Osaki, Japan, remotely as above), 2015 October 13.40691 UT, 47.74s, 03.7". Congratulations to Koichi Nishiyama and Fujio Kabashima and to Shigehisa Fujikawa on their discoveries!